At just £20 are they the perfect iPod upgrade? 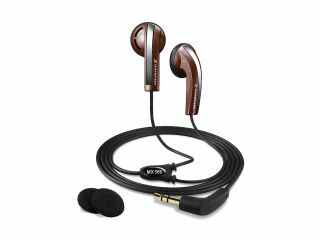 Sennheiser has added a new set of budget in-ear phones to its range in the shape of the MX 560. Available in a choice of shiny black, shiny white, shiny silver, burgundy red or aqua, the new phones are aimed directly at anyone looking to upgrade their iPod or supplied MP3 phones, hence a price of just £20 a set. Sennheiser claims that the only cheap thing about its new phones is the price. The MX 560s come with a gold-plated 3.5mm jack, 1.1m-long cable, patented ‘Basswind System’ for extra low-end boom and ‘Ear Hook’ design to stop them slipping off. Performance wise, the MX 560s boast a frequency response of 19-20000Hz, an impedance of 32ohm and a sound pressure level of 112dB. Hardly audiophile grade then, but not at all bad for twenty notes.